Although they are technically more Council event patches than Order of the Arrow event patches, I've included the Heritage District Fall Camporee patches in the Lodge 333 activity emblems page because those events are sponsored annually by Wicomico Chapter of Wahunsenakah Lodge. 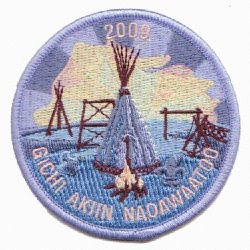 George Homewood kindly noticed my omission of First Colony District Winter Camporee patches, and generously sent several to me for inclusion on the site since this event is sponsored each year by Piankatank Chapter of Wahunsenakah Lodge. Thanks to George you will now find pictures of the patches issued for this event from the years 2004, 2006, 2007, 2008, and 2009. An interesting feature of the most recent patches is the inclusion of an event name in the Native American language. See the listings for translations!